When the readings of the day start with Exodus and the bread of life conversation, I can’t help but just pick up and listen more. 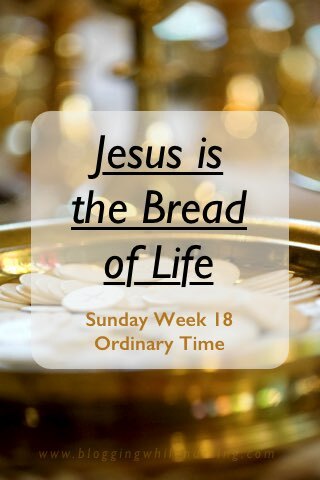 I’ve always loved this time of the year, because we are reminded that Jesus is the bread of life, but we are able to see this throughout the Gospel for the reading. There are three main things that I took away from these readings. We are not satisfied until we have the bread of life. In the first meeting we have the Israelites in the desert who were complaining to Moses about not having everything they had in Egypt. They complained of not having their fill of food, and how much better the lived when then were in Egypt. In life we’re always going to search for the next best thing. We’re always going to look for something that satisfies us. We will never be satisfied until we are full with Christ. Jesus always leads the way. I truly love this. The crowd is looking for Jesus, and they didn’t find him, so they went across the sea, they found him and asked him, “When did you get here?” Jesus is always a head of us, always leading us to the direction that we’re supposed to go. Never once did Jesus tell his followers to do something that he has not done. Our true Shepherd leads us in the way we should live, and shows us what we’re supposed to do. Jesus never lets us down when we follow him. Jesus knows us better than we know ourselves. Oh man, to be questioned by Jesus and called out! He knew why they were looking for him. The people wanted to eat. The followers not so much concerned about the life that he was offering to them; they followed him because he did something for them. Jesus knew it too! Are we only asking for something, or maybe praying for something that we want? Deep down hoping that God will grant it because we asked for it. What happens when we do not get it? Do we still follow him? How do we handle our disappointments? Are we only in this relationship because we want something out of it? What are you thoughts on this Sunday’s Gospel?